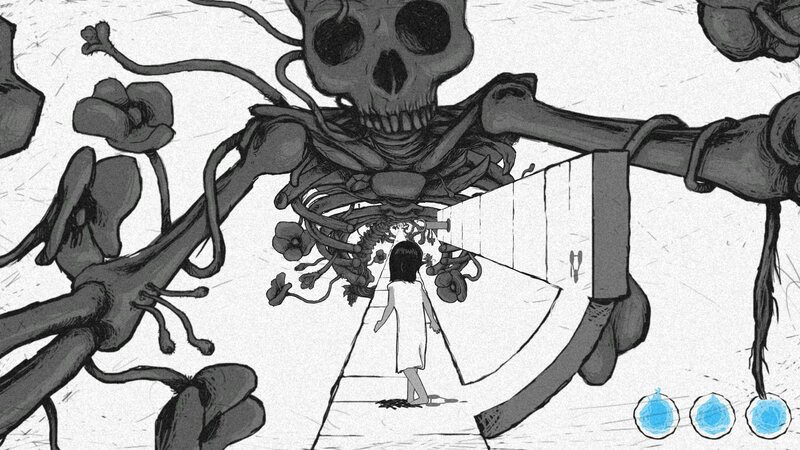 As a collection of puzzles Path To Mnemosyne is a peculiar conflation of ingenious and over-familiar, as well as having a name you’ll never remember when you want to find it on Steam later. As a small vignette, it looks beautiful (if slightly held back by clunky controls) offering smart puzzling ideas, in between some of the most hackneyed puzzles you can think of. I rather liked it. Presented in a scribbly hand-drawn style, predominantly grayscale, it’s a striking and splendid look. The screenshots look great, but the game itself looks better, the scribbles wiggling and squiggling as you play, appearing impossibly from a central point as you progress ever forward. Movement is pretty simple. You primarily go forward or backward along a seemingly infinite path, that ever-stretches to a vanishing point, left and right reserved for sidling along curved paths that loop around the screen. You are, essentially, in a magic tunnel. Early puzzles are solved by standing on marked spots that let you rotate the paths ahead or behind you around their invisible central pivot, rearranging the pathways, and walking over buttons. But then you must also jump, and the game isn’t quite up to it. It’s an stilted affair, with no fluidity – you essentially come to a standstill and do an awkward feet-together hop. And I thought, “Uh-oh”. And then, you know what? It didn’t much matter. It’s a short game, which certainly helps. It’s also one that’s visually fascinating, both in terms of the extraordinary hand-drawn beasts and skellingtons and body parts that encircle the path, and in how the whole game stretches before you (and indeed behind you) throughout. Escher-inspired in places, the game hypnotically appears as you run toward it, revealing intricate creations about you. What you’re doing swings pendulum-like between interesting and creative puzzles, and ideas as hoary and groan-inducing as pattern repetition. Press the buttons in the order they lit up. No! Don’t wanna! Already did in 80 million other games! And then just as I’m moaning to myself about that, I’m working out how to use teleporting holes and rotating platforms to propel myself to hard-to-reach places. Or spotting tiny hidden details in the amazing drawings that tip me off about what I should be trying to do next. I don’t think the game quite achieves its ambitions with its story. 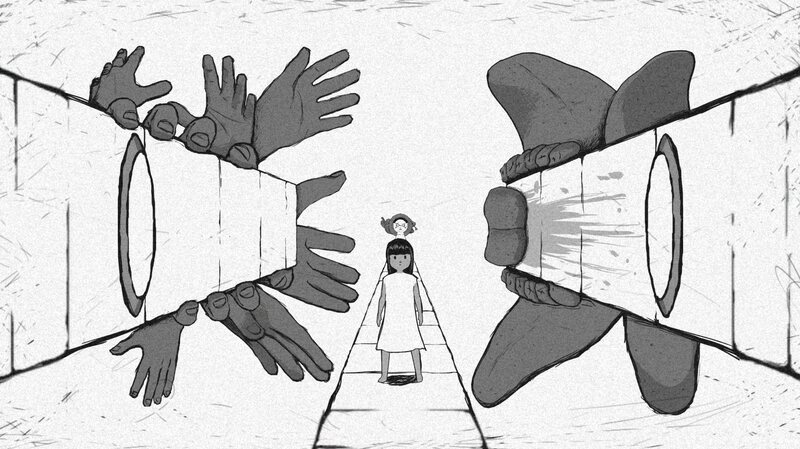 You play a young girl, seemingly trapped in some sort of metaphorical reality, as an increasingly unreliable narrator encourages you to gather memories in the form of blue orbs, unlocked by solving puzzles. Flashes of memories on successfully completing a section show grotesque visions, or frightening faces, implying some manner of horror, and in which direction this is heading is yours to find out as you play. But the endings don’t quite deliver on the promise of the build-up, leaving too much narrative work for the player to do where the game abruptly stops. Which led me to think that it didn’t really earn its glimpses of horror for a little girl motif. That certainly isn’t helped by the school nativity-level acting from the detached voices that follow you as you play, lines clumsily intoned in a rather atmosphere cracking way. So it’s testament to that atmosphere that it survives this. The game’s Steam page rather peculiarly has an age gate on it, which itself explains that there’s no obviously adult content within. I thought this seemed like overkill, until my three year old watched me playing for a bit. I figured he’d enjoy the drawings of animals he’s into (snakes, sea creatures – I wasn’t in a section with the scary skulls or the like), and the strange way the tunnel impossibly appears, but very quickly he trembled, “Daddy! I don’t like this game!” and made his exit. Oops. But yeah, point made. That rather works. So yes, it’s a bit of a muddle, but it’s a really interesting one. I could really do with never playing another pattern repetition puzzle again as long as I live, let alone the requisite set of three. But then I’m always up for scouring scenery for tiny clues and experimenting with game worlds to see how they apply! I probably never need to see another “child trapped and probably tortured” excuse for esoteric gaming weirdness, but then again I love how creepy the game manages to be despite those hokey moments. Also, gosh, it’s just so wonderfully animated and drawn. I should add that I did have to contact the developer at one point, because I was so mystified by a puzzle. It turned out I’d correctly figured out what to do, but the demands of its timing are astonishingly precise – too much so I’d suggest, since reflexes aren’t most puzzle-solvers favourite requirement – not least in a game where movement is too clunky to merit the demand. And it’s worth adding that in his reply, I was told the game draws from a philosophy of Greek mythology and metaphor in ways I’m too much of a thicko to have noticed. But ace. I mean, you’re probably rolling your eyes at me because you already knew that Mnemosyne was a Titan, daughter of Uranus and Gaea, and the goddess of memory, but you probably went to a better school that wot I did. Classical education standards aside, this is certainly a mixed bag, but a very interesting one, and I’m certainly very pleased to have played it. If they could have ditched the dullest puzzles for more of the smartest, and had that jump feel a little less awkward, I think it would have shone. But it still glimmers rather nicely, and for a price that makes it worth it. 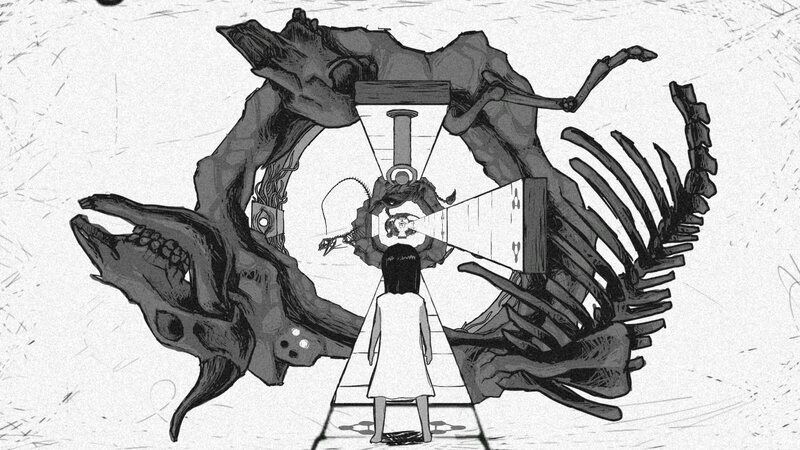 Path to Mnemosyne is out on Steam on Wednesday Spetember 26th for $10. 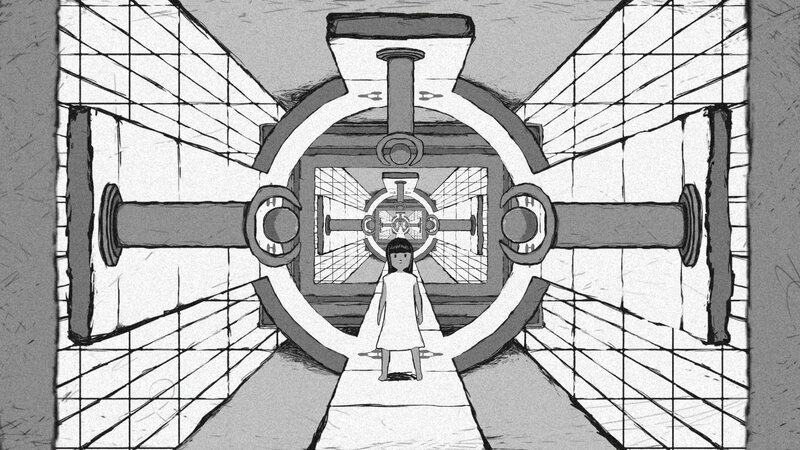 Tagged with Devilish Games, feature, review, wot i think, Path to Mnemosyne.